Welcome to part two of our bucket list series here at Holidaysafe all about Ireland, #HSBLS. This week we are focussing on the Emerald Isle. Ireland is famous for many things, including beautiful landscapes, vibrant cities, Guinness beer and Oscar Wilde (to name a few), as well as the background for many films and TV series. From London, it takes approximately 1 hour and 20 minutes to fly to Dublin, costing around £140. You are also able to take the ferry from Wales – Pembroke and Holyhead as well as Liverpool to get across to either Dublin or Rosslare. Taking anywhere from 1 hour and 50 minutes to nearly 8 hours. As Ireland is getting more and more popular as a destination, there are more options than ever before. Airbnb is an ideal place to start looking, although if you aren’t a fan of sleeping in someone else’s bed, Booking.com is a great alternative too(the added benefit of using them is being able to pay on departure). There are some amazing places to see and loads of things to do, but in this post we’ve compiled our absolute favourites to get you inspired. 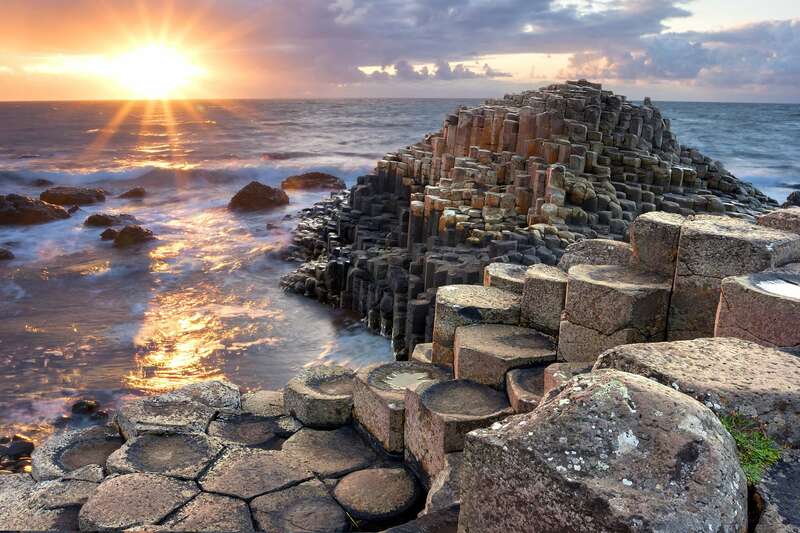 One of our favourites, the Giants Causeway is run by the National Trust in Northern Ireland. It is most famous for holding around 40,000 interlocking columns – the result of an ancient volcanic eruption. Located in Country Antrim approximately 3 miles from the town Bushmills and declared a World Heritage site in 1986 by UNESCO as well as a natural nature reserve in 1987 by the Department of the Environment for Northern Ireland. It is one of the most popular attractions, according to legend, the columns are remains of the causeway built by a giant, hence the name. The Giant’s Boot – Apparently lost by the giant, and supposedly a size 93.5. The Wishing Chair – A naturally formed chair, now made shiny and smooth by everyone who has already sat on it. Grand Causeway – The largest of three rocks that make the causeway up, and what contributed to the UNESCO declaration. Shepherd’s Steps – Not for the faint hearted, the 167 steps are best to be experienced from the Red Trail along the cliffs. The Camel – Now turned to stone, the camel lives at the bottom of the cliffs after being the giant’s means of transportation. Visitors Centre – Opened in 2012, it has won multiple awards for design innovation. As Ireland is famous for some of our favourite tipples, there are many tours and trips you can take part in that relate to them. 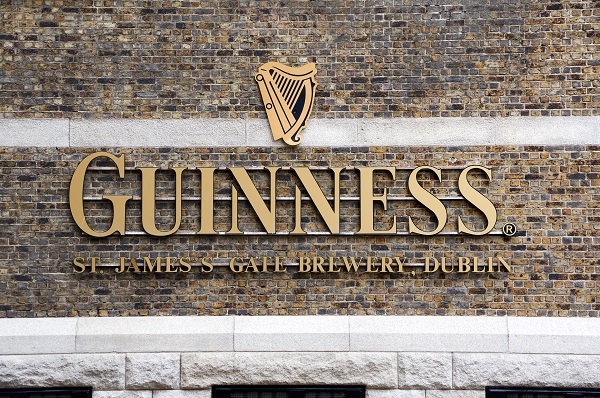 The Guinness Storehouse in Dublin costs between £23 – £68 depending on what you want to see and do during the tour. Named as Ireland’s no.1 tourist attraction, the seven-storey experience explains the story of Irelands most famous beer. All tickets include a complimentary pint of Guinness (valid ID required), with under 18’s receiving a soft drink. You can find the tour at St. James’ Gate Brewery in the heart of Dublin. The tour starts at the bottom of the world’s largest pint glass, and as you complete the tour, the pint glass is filled and you receive your complimentary pint in their rooftop Gravity Bar. 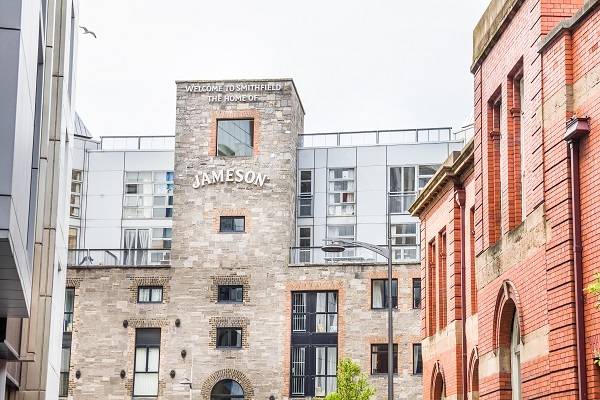 Jameson Distillery Tour also in Dublin costs between £18 – £60, depending on the experience you choose. Over 200 years since it opened in 1780, the distillery is still thriving and happy to show the public how their whiskey is made. It is located in Bow Street and is open 7 days a week, and the last tours run between 5.30pm and 6.30pm. As part of the tour you will be invited to touch, smell and taste this gorgeous whiskey. One of the best bits of the tour is the Maturation Warehouse where you can have a taste straight from the cask itself! Craft beer more your thing? Not a problem! Brewery hops, based in Dublin, specialise in small group tours. The tour itself takes you on a craft beer extravaganza, appreciating Ireland’s emerging craft beer scene. 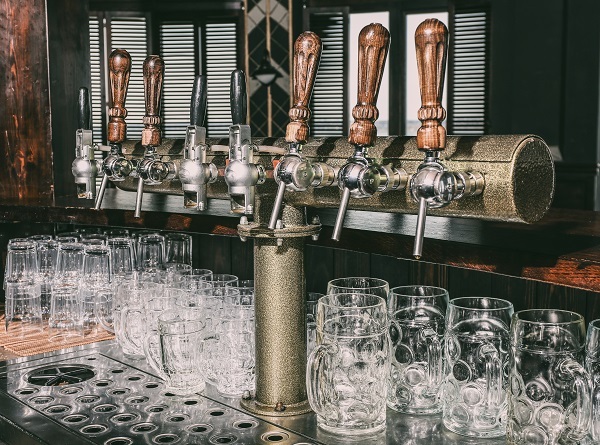 Their 1 Day Craft Beer, Food and Scenery Tour costs €100 per person and takes you to two of the country’s newest craft breweries, as well as enjoying a 5-course lunch at Mickey Finn’s bistro. Blarney Castle is located approximately 5 miles from Cork City. It is most famous for the stone, named the Blarney Stone which is the legendary stone of Eloquence. In order to kiss it, you have to lean backwards whilst holding onto an iron railing and it is said that once kissed, you will receive the gift of the gab. Located at the top of the tower, at 37 feet high, you will need to climb 127 steps in order to reach it. Costing £14 for an adult and £6 for a child, you can’t go wrong. A lot of tour operators in Dublin will also do day trips for around £45/50. The castle grounds also have many hidden gems to find, including the Poison garden, witches’ kitchen and the Fairy-tale area. Top Tip: We would recommend giving yourself at least 4-5 hours to explore the castle and its grounds, and to also bear in mind that peak season will mean increased queues to kiss the Blarney Stone! 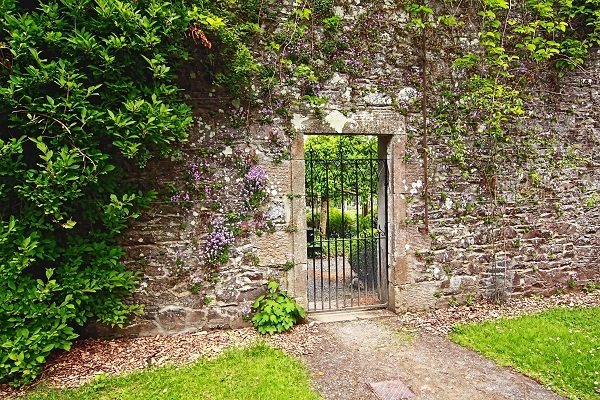 Klyemore Abbey in Connemara, is a gorgeous abbey with a Victorian walled garden. Home to the Benedictine nuns since 1920, it is now one of the most iconic tourist attractions in the West of Ireland. It is a 1,000-acre estate that’s history entails tragedy and romance, with woodland and lake walks, including a 6-acre walled garden with resorted garden buildings. There is also a Gothic church just a short walk away as well as a mausoleum. The Giants Ironing Stone is a great place for children to make wishes, and there are visual presentations as well as History talks. Kids under 10 go free, with adults costing £12, but there is a 10% discount available if booked online. Newgrange, is approximately 5 miles west of Drogheda, and was built around 3200 BC. It is older than the pyramids in Egypt and is a UNESCO World Heritage Site. Spread over an acre, and surrounded by 97 carved kerbstones. It is said that the cremated remains of the dead were buried under the mound in large basins. On the shortest day of the year (21st December) sunlight shines directly into the central chamber and it is believed this was their way of measuring time. Access to the winter solstice experience is only available for 50 people and is chosen by a lottery. You are only able to access the tombs with a guided tour from the visitor centre in the Boyne valley. 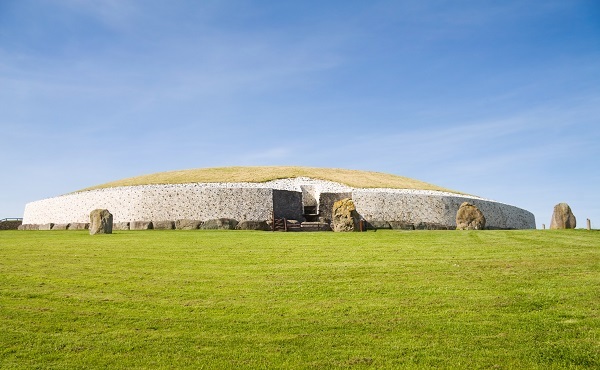 Prices range from £4 per adult up to £14 depending on what you want to see, as there are also other historical points of interest nearby including Knowth. If you are a Golf fan, you will know that Ireland is home to many famous Golfers, including but not limited to, Rory McIlroy, Shane Lowry and Paul McGinley. Royal County Down, originally laid in 1889 is one of the most famous clubs, hosting the Irish Open in 2015. Visitors are able to play here Monday, Tuesday and Fridays, Thursday mornings, and Sunday afternoons. You are able to hire clubs and shoes if required and all information about Green Fees are available here. Also bear in mind that, if you are a keen golfer, you will need to ensure you have the correct travel insurance. Golf can be expensive once everything is paid, and if something occurs meaning you are unable to play, you want to have the best possible cover. With so many beautiful beaches in Ireland, it is hard to choose just one. Murrisk Bay however, gives you the option to ride horseback along the beach and in the surf. Located at the foot of Croagh Patrick on the west coast of Ireland. Beach trekking or water gallops can be organised depending on tide and experience of the rider. The stables close by have horses that range from Shetlands for younger children to large geldings for the more experienced rider. They also have two sanded arenas at their stables and cater for all ages. There are also many other outdoor activities you can take part in. 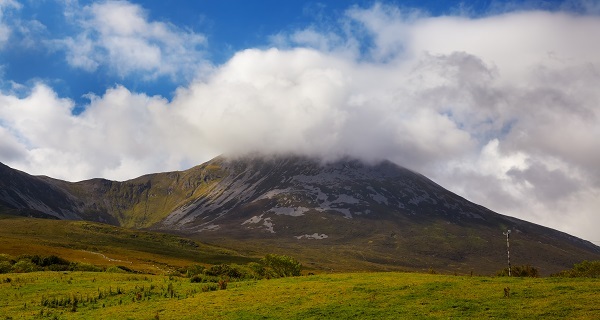 Whilst you are there, why not climb Croagh Patrick too? Reaching 765 metres above sea level, you will need to allow approximately 4-5 hours to reach summit and return to the base. It is well known by the religious community as the Holy Mountain. Regular pilgrimages take place here annually on the last Sunday in July, locally known as ‘Reek Sunday’. Ensure before you climbing you have checked the weather and wear appropriate clothing. Ever fancied going on a bat walk? Now you can. Glendalough, located within Wicklow National Park hold an annual bat walk in August. 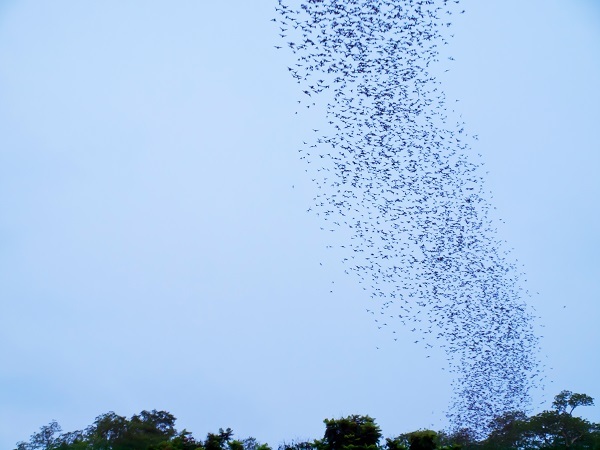 Starting at dusk, you can watch the bats emerge from their roost in the information office, before heading off to see some more species. Bug spray and a torch are recommended, and the event is free of charge with no booking required. The car park is your only cost at approximately £4/£5. Visit the southern most tip of Ireland at Mizen Head. It is best to try and visit when the weather is good as the bridge can be shut during bad weather for health and safety. The bridge itself stretches over a gorge linking you to the signal station where three light keepers lived until 1993. 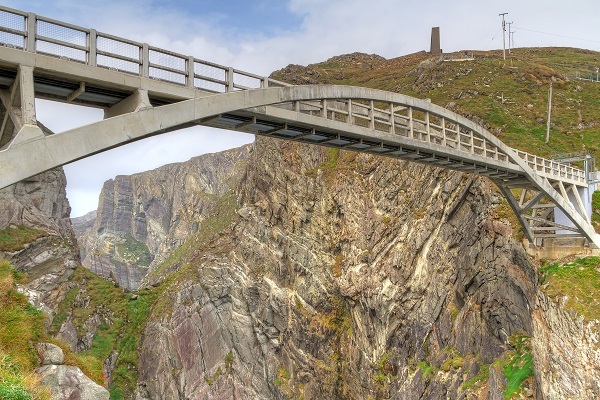 You will need to be relatively agile to make it to the bridge as you have to tackle 99 steps down to cross it. Keep an eye out for dolphins, basking sharks and whales as Mizen Head is a well-known sea watching spot. Under the bridge, seals and their pups have been known to retreat here. Costing just £7/8 for an adult, £4/5 for children under 14 and children under 5 going free, it is a cheaper option than some. Sligo is home to Voya, who have introduced Seaweed baths to the world. As strange as it sounds, the process can make your skin super soft. 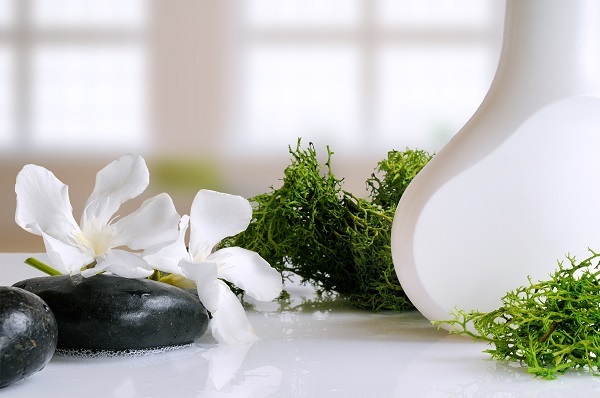 They start the experience with a steam to open your pores, to ensure you get as much the most benefit from your treatment. You will then be immersed into a bath full of fresh seaweed from the coast. The idea is to relax your muscles, plump up and add definition to the skin, and to combat signs of aging. It also contains Vitamin A, C, E, D and K as well as Folic Acid, to naturally soothe and moisturise your skin. The Price for a single bath and steam is £30 per person for 50 minutes. The baths are located in Strandhill in Co. Sligo, and were started by Neil Walton, who began having seaweed baths following training for marathons with his father in order to aid recovery. There are obviously many, many more places to see and things to do in Ireland.